Overwatering vs Underwatering Marijuana: How can I tell if my droopy cannabis plant is over or under-watered? 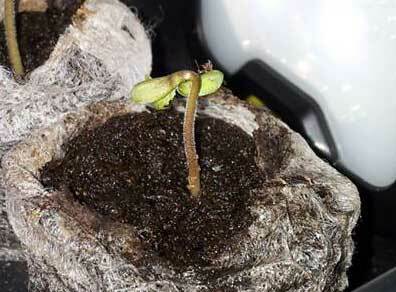 A common question for new cannabis growers is how to tell if your drooping cannabis seedling is over or under-watered. It’s common for new growers to overwater their weed, but that doesn’t mean that underwatering doesn’t happen too. Never fear, once you get a feel for it, it’s easy to tell how often you should be feeding your plant and what is the true cause of your drooping. 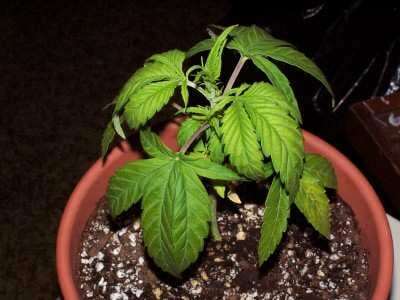 If your marijuana shows signs of drooping in normal temperatures, it almost always means you’re over or under-watering your plants, either by watering too often, or by giving too much water at a time when the plant is too young to drink it all. 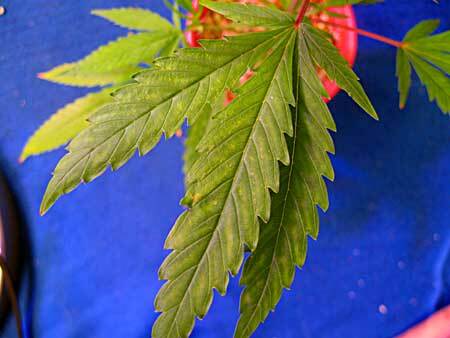 How often should I be watering my cannabis plants? Water your marijuana when the top of the growing medium starts feeling dry up to your first knuckle. You should stick your finger 1-2″ into the soil. Wait if it’s damp, but water your plant once it feels dry. Learn everything you need to know about watering your plants! 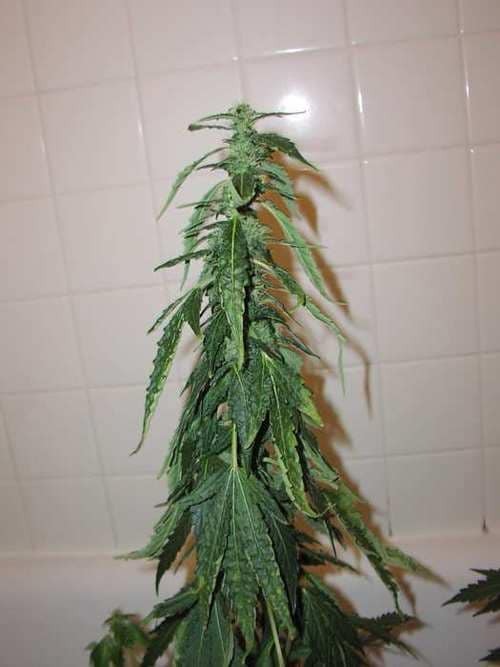 An over watered cannabis plant will have leaves that are full of water, so the leaves will be firm to the touch and generally curling down (even from the stem of the leaf) almost as if it has too much water weight to hold the leaf out straight. 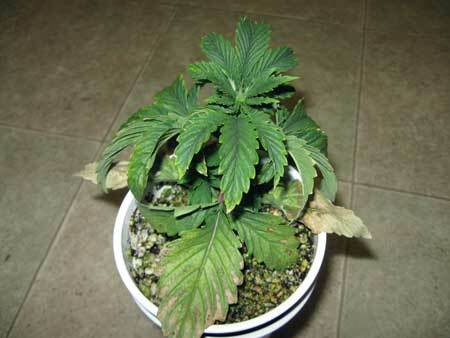 An under watered cannabis plant will have leaves that are brittle, limp, and lifeless. They will need to be watered every day just to keep them wet. The leaves will seem to be drooping but won’t appear as rounded and full as an over watered cannabis plant. Now that you’ve (hopefully) got an idea about whether it’s over watering or underwatering, what’s the cure? When a cannabis plant is “overwatered” it has less to do with the water and more to do with oxygen. Plants can even grow directly in water (hydroponics) but in order to thrive, roots need oxygen. In hydroponics, that’s accomplished by dissolving oxygen into the water. But when plants are grown in a container, too much water = not enough oxygen. When a plant’s roots are sitting in water, they quickly use up all the oxygen until the growing medium starts to dry out. Without enough oxygen at the roots, the plant will start showing symptoms of oxygen deprivation. 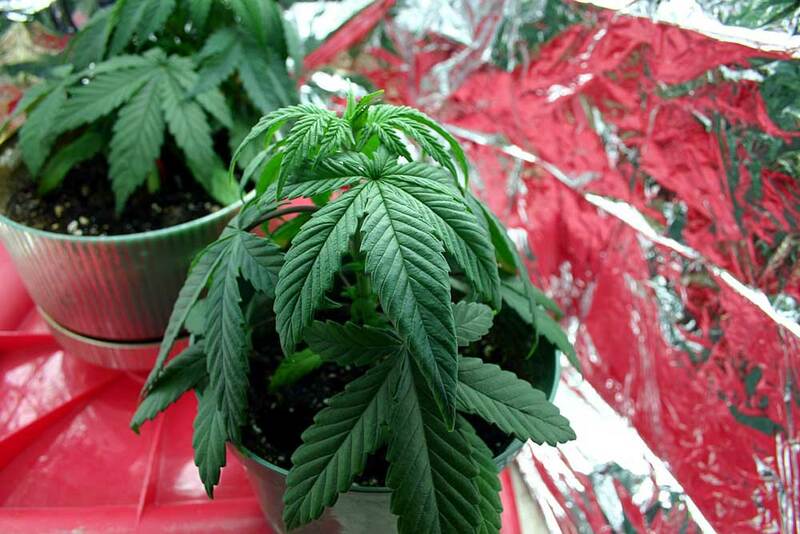 Luckily, there are many steps you can take to prevent overwatering your cannabis plants. When you have a small plant in a very big pot, it’s easy to overwater because the roots aren’t drinking much yet, and the big container takes a long time to dry out. 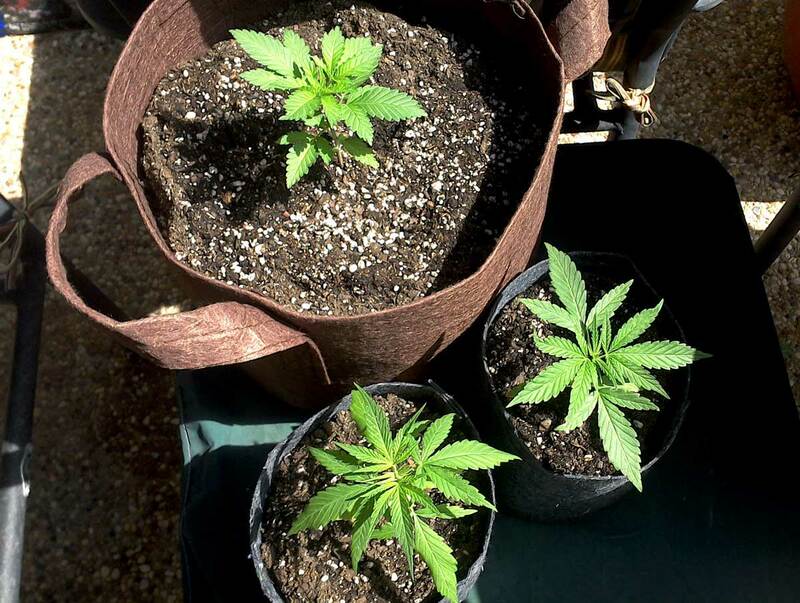 Notice how the plants in smaller containers have grown more than the plant that was put in a big container as a seedling. 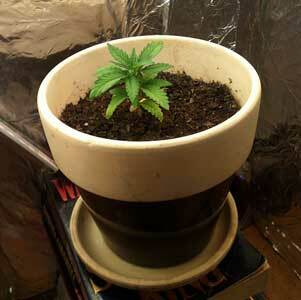 It’s common for plants in too-big containers to grow a little slowly at first. These small cannabis plants (below) were put in big pots, and were given enough water to support a much larger plant. The plants couldn’t drink all the water that was given to them and as a result, their roots weren’t able to get the oxygen they needed and started “drowning.” Once the roots are out of commission, the leaves start drooping. 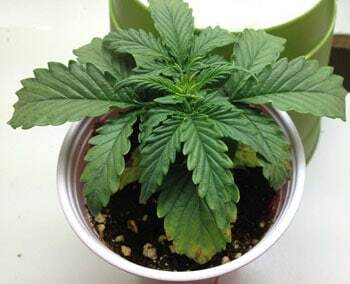 One way to prevent this from happening is to make sure your plants are in an appropriately sized container for each stage of their life; this is done with transplanting. First, you need to get a general idea of the final container size which will be based on how big you want your plants to grow. The less often you transplant, the bigger the final size pot you’ll need because the roots will tend to grow out and cover the whole container if left too long. 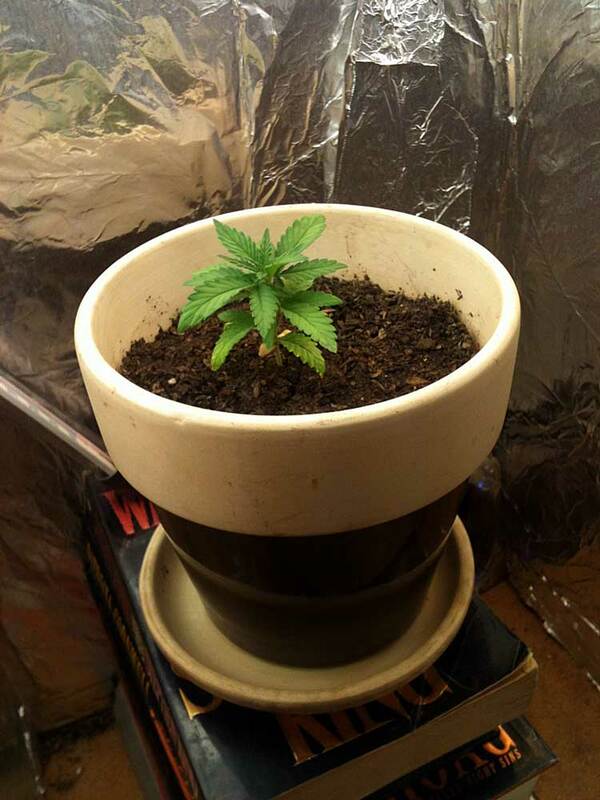 You can help avoid problems with roots getting rootbound by using a fabric pot (also known as a “Smart Pot”) or an air pot. But what size pot should you use for your seedlings? 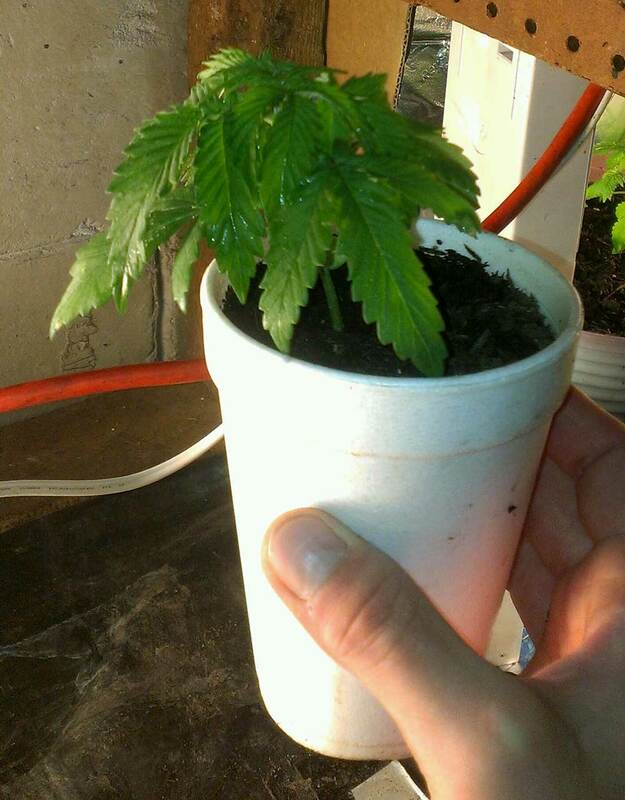 For fastest growth rates, it’s better to plant young seedlings or clones in a very small container, like a disposable plastic solo cup. There is no perfect transplant guide, but the one above should give you a general idea of where to start. Why don’t you want to go from a solo cup to a 5 gallon pot? 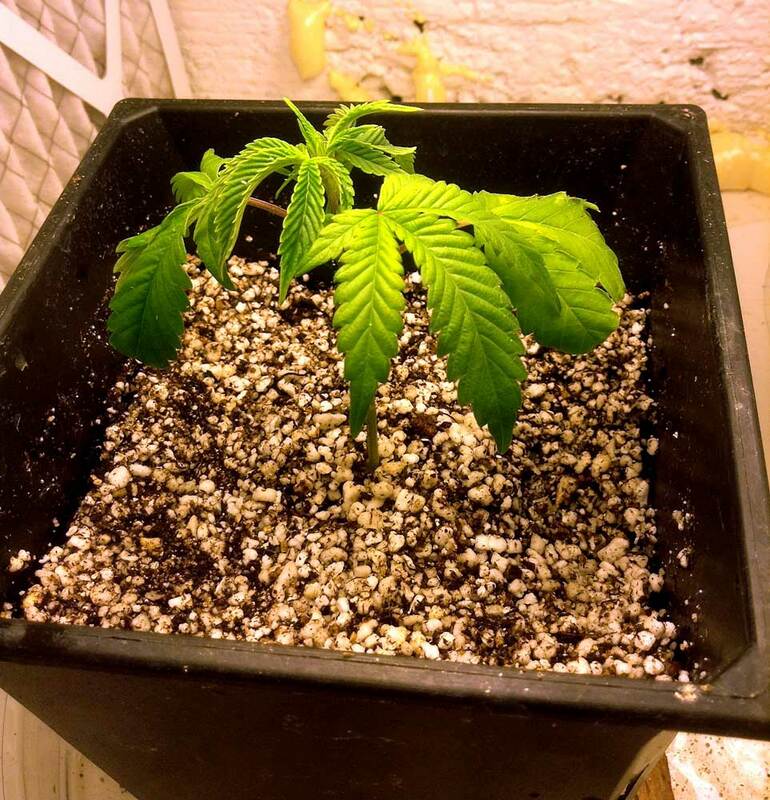 Or why not just start in a 5 gallon pot? Young plants won’t be growing very fast yet, so they also won’t be using much water. When you completely saturate a big container that slow speed means that the plant won’t be able to drink all the water. Since so much of the water is contained in the middle without access to air, it won’t be able to dry out by evaporation. This means you’re left with a huge container full of wet potting mix. 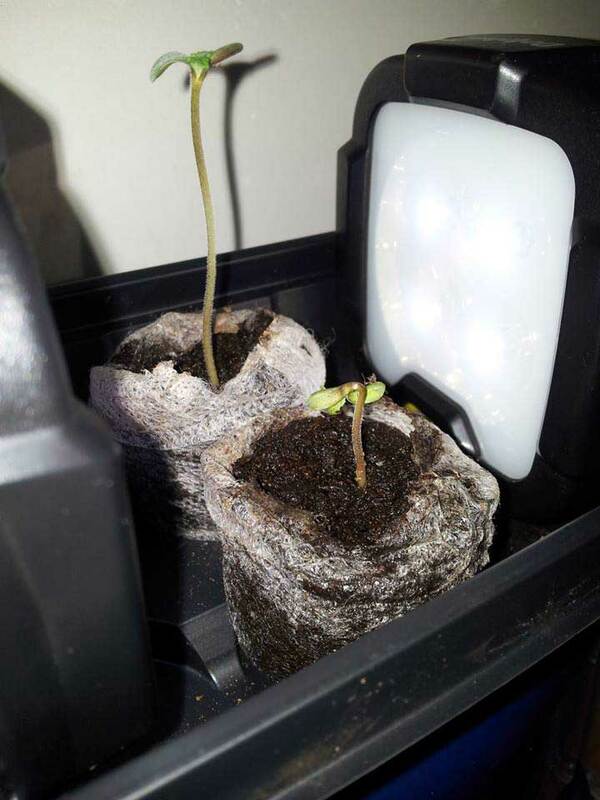 The young cannabis plant roots will quickly use up all the available oxygen that’s been dissolved in the water, and then the roots will sit in water until the water slowly evaporates on its own. 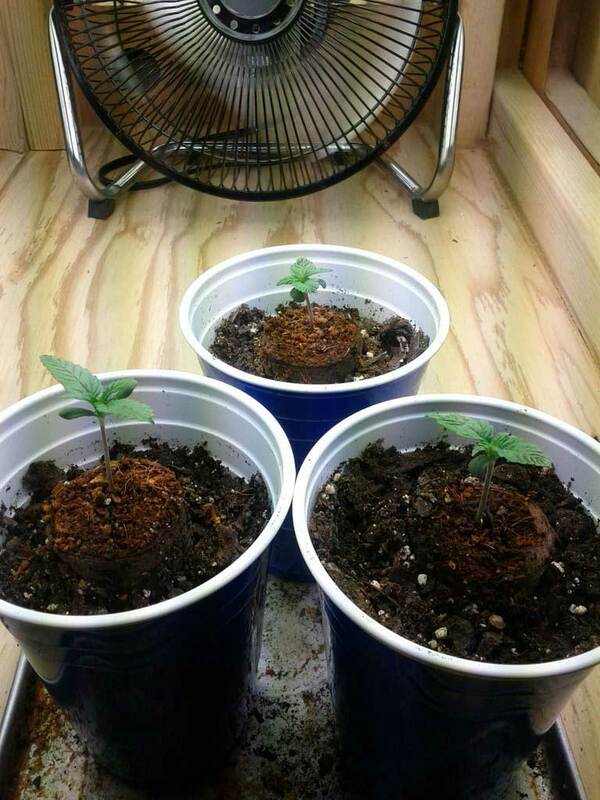 Some containers such as smart pots and air pots allow air in from the sides, which can help dry the growing medium faster, but it’s better to use proper technique from the beginning. Planting in too big a container is sometimes called “overpotting.” It’s possible to get around this with special watering techniques (for example by giving plants just a little bit of water until they start “growing into” their containers) but starting plants in small containers and transplanting as needed can be a more straightforward way for some growers. Overpotting plants is also a waste of growing medium and nutrients, especially if the plants never get big enough to fully use their containers. This OG Tahoe Kush seedling was overpotted, though this can be overcome by the grower just giving a little bit of water at a time until the plant starts growing vigorously. 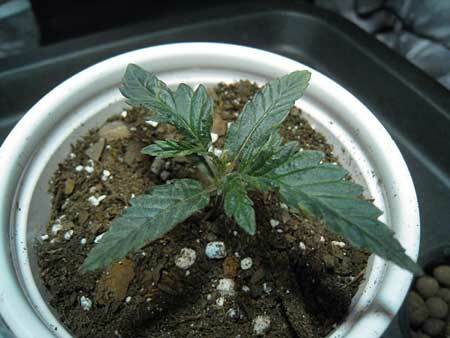 At that point, the grower can provide more and more water until they’re finally watering normally. While using a too-large container can cause problems for seedlings, so can too-small of a container. If the seedling isn’t transferred to a bigger container in time, it can cause symptoms of overwatering, nutrient deficiencies, wilting, and sometimes very strange and unpredictable symptoms. These plants were left in a too-small container for too long. 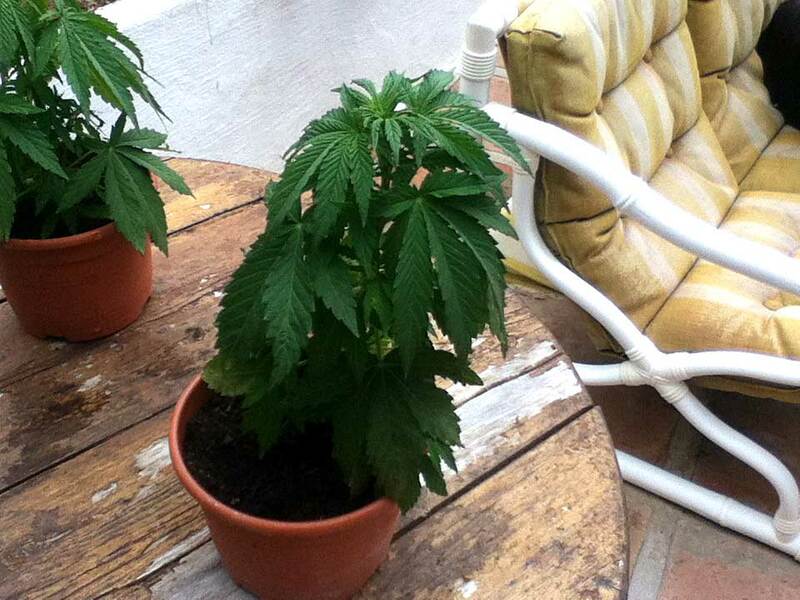 Because they were drinking so fast, the grower watered them frequently – too frequently! This combination of being root bound and overwatering caused the plants to suffer. Pink leaves, red discoloration, rusty spots and edges… While it make look like these cannabis seedlings are experiencing nutrient deficiencies, all these symptoms are actually caused by a combination of overwatering plus a too-small pot. 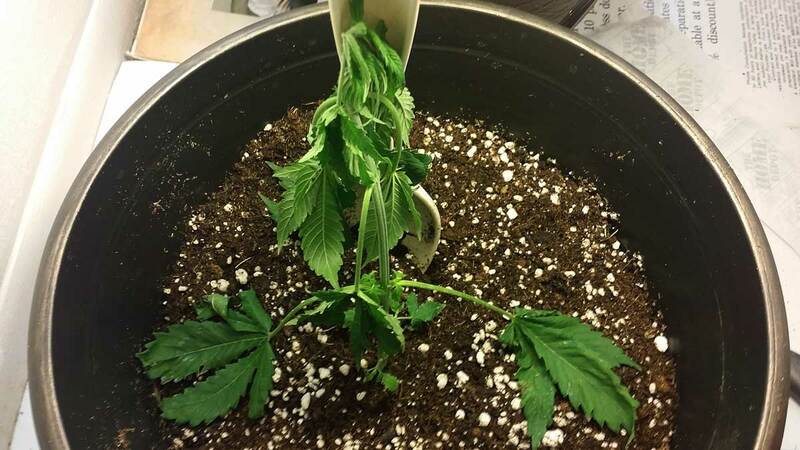 When the roots aren’t happy, the plant isn’t able to uptake nutrients properly and cannabis seedlings can show a wide variety of strange problems. 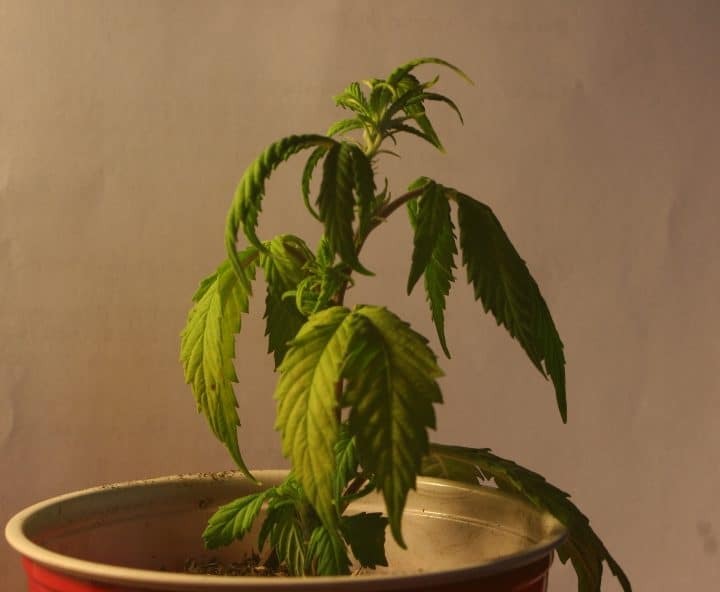 It’s usually not a good sign when cannabis leaves start “crossing their fingers” like this (instead of having all the leaf tips spread out). 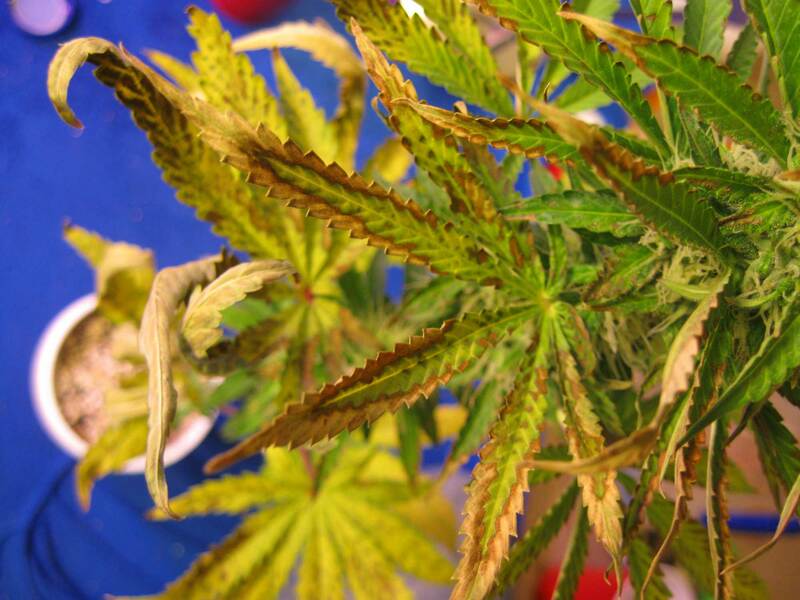 While this can happen naturally every once in a while, you know for sure that you’re having a problem if the crossed fingers are combined with discoloration of the leaves. Also notice how the stems are bright red/pink. 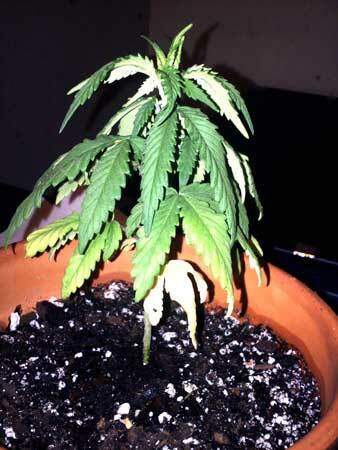 The following cannabis plant was also overwatered and had no drainage. Notice how dark the soil is and the green algae growing all along the top of the soil – these are more signs the plant has been overwatered for quite a while. You should never water your plant when the soil on top is still wet, and if you notice lots of algae growing on top of your soil, it may be a sign that you’re overwatering on a regular basis. 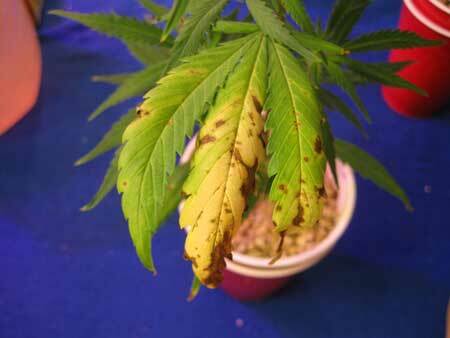 Leaving the top of the soil wet is also the number one reason growers get fungus gnats. 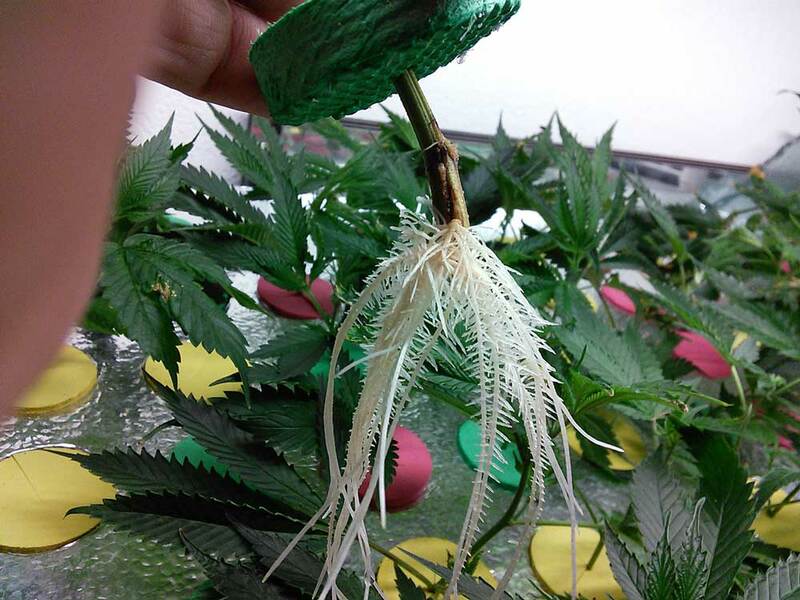 Cannabis roots need oxygen to thrive, and therefore they will have trouble if the roots are “drowned.” If water cannot run out the bottom of the container, it will pool at the roots, which causes overwatered plants. 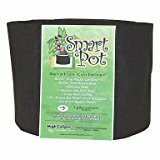 Get a container that helps the growing medium dry out from the sides (such as “Smart Pots” – highly recommended; or air pots). 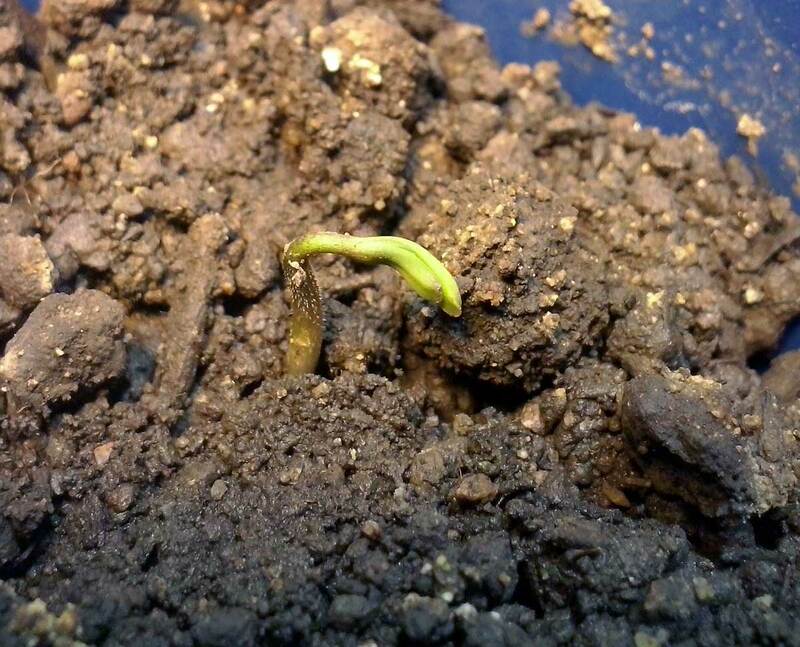 This seedling started “damping off” (dying) due to terrible drainage from bad soil. Never use soil that looks like it contains clay! Here’s another example of a seedling damping off due to too much water (drowning roots), whis time combined with not enough light. After a few days of these conditions, this seedling just fell over and started dying. The following plant was grown in an unsuitable growing medium with no drainage and started showing signs of overwatering. Always start with a quality potting mix that has good drainage, and never allow the top of your growing medium to look this wet! This “soil” is more like mud. 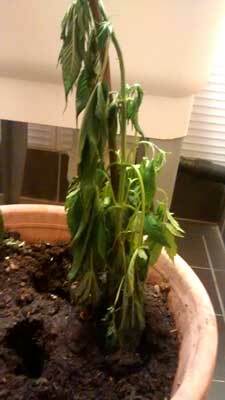 The plant roots are drowning from lack of oxygen, causing severe wilting. While oxygen is available to the roots immediately after watering, the roots use up all the oxygen quickly if they are sitting in water. If all the oxygen is gone, roots are not able to get what they need to help power growth, at least not until the growing medium begins to dry out and create new air spaces in the growing medium. Each air spot in the potting mix provides roots with precious oxygen, but if there’s no air spots, roots start to “drown.” By watering seedlings less often, growers can ensure that roots are getting access to plenty of oxygen at all times. Of course you should never allow roots to actually dry out – roots need moisture at all times. But for new growers who want to do everything possible for their new seedlings, it can seem like more water = better. Unfortunately, this isn’t true. Roots work best when they get as much oxygen as possible while also staying completely moist at all times. Wait until top inch is dry. Make sure that the top bit of potting mix has started to dry before you water seedlings again. Sometimes it can take a few days, depending on your growing medium, your environment and how much water you provided during the last watering. Increase the number of air pockets in the growing medium by mixing in a “lighter” amendment like perlite to the potting mix. Perlite will allow the mix to hold onto more oxygen when mixed with heavy soil. 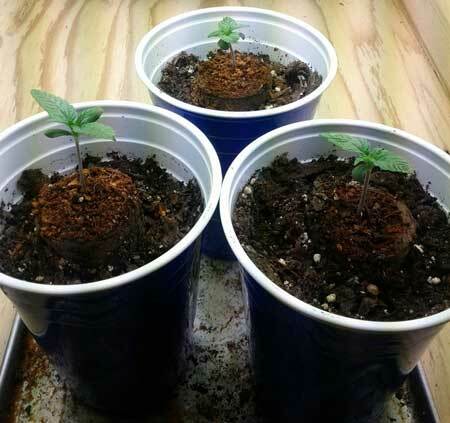 Many cannabis soil growers will mix 30-40% perlite into their potting mix to make sure there’s lots of drainage and plenty of air available for the roots. Provide air from the sides. Transplant to a container which allows air in from the sides like fabric pots (“Smart Pots” – highly recommended) or air pots. Start in a smaller container until plant gets bigger so there’s less water in the potting mix that needs to dry. You’ll be able to water your plants more often while ensuring they get plenty of oxygen. Water less when it’s cold. Plant processes tend to slow down when temps get cooler. This means that plants usually need water less often than normal after a cold snap. 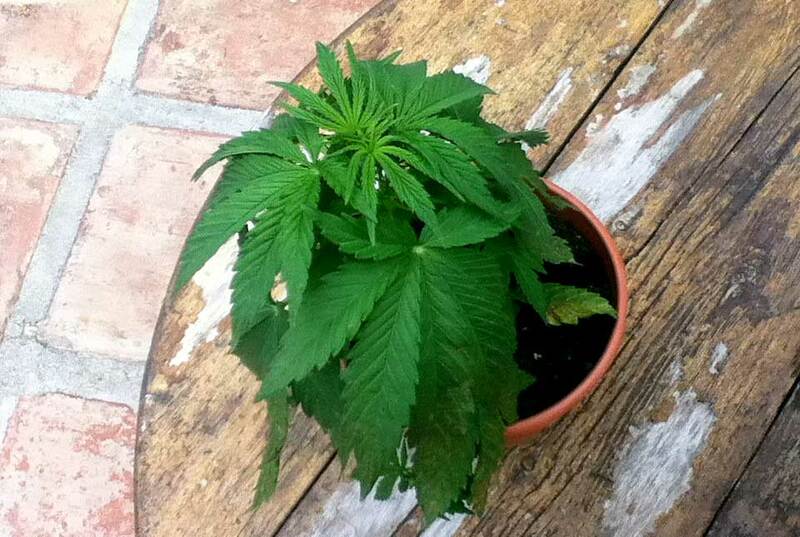 This plant went through a few cool days but the grower continued to water as normal. As a result, the plants roots were surrounded by too much water and the plant started showing signs of overwatering. The plant was watered the right amount each time, but too often. As a result, it shows some slight drooping. While this won’t kill the plant, the plant will definitely grow faster when the mix is allowed to dry out a bit so the roots are getting plenty of oxygen. While overwatering is the most common seedling symptom, underwatering is also a problem, especially for those who have been warned to avoid giving too much water. It can be confusing because the symptoms often look similar to each other, which is why it’s important to learn good watering practices. 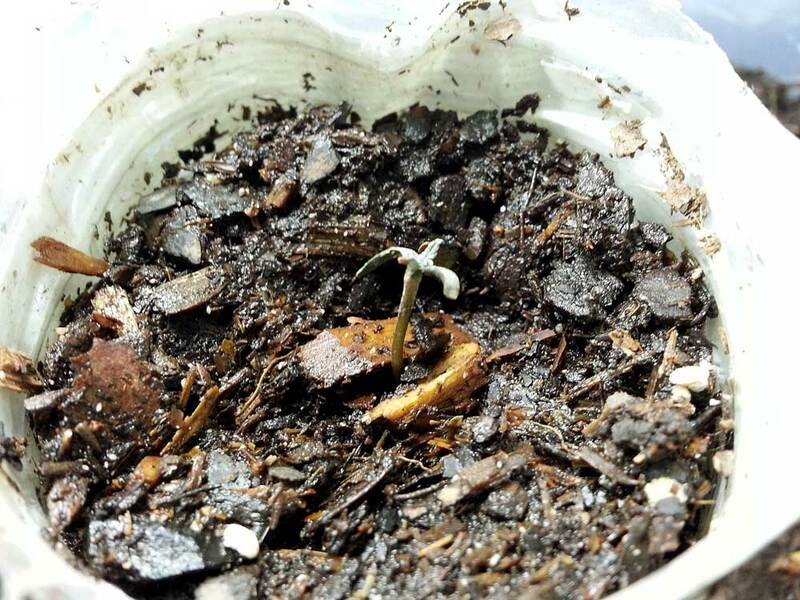 This seedling was underwatered – the grower had been warned many times to avoid overwatering, and went too far in the other direction. Notice that the growing medium looks bone dry. It’s crucially important to make sure that plant roots have access to moisture at all times. Plants are constantly losing water through their leaves (called “transpiration”) and this is actually how plants get water up from the roots. As the plants lose water from the leaves, it pulls water up from the ground like a straw. When there’s not enough water at the roots, many plant processes cease to function. If roots actually dry out, the dried shoots die. 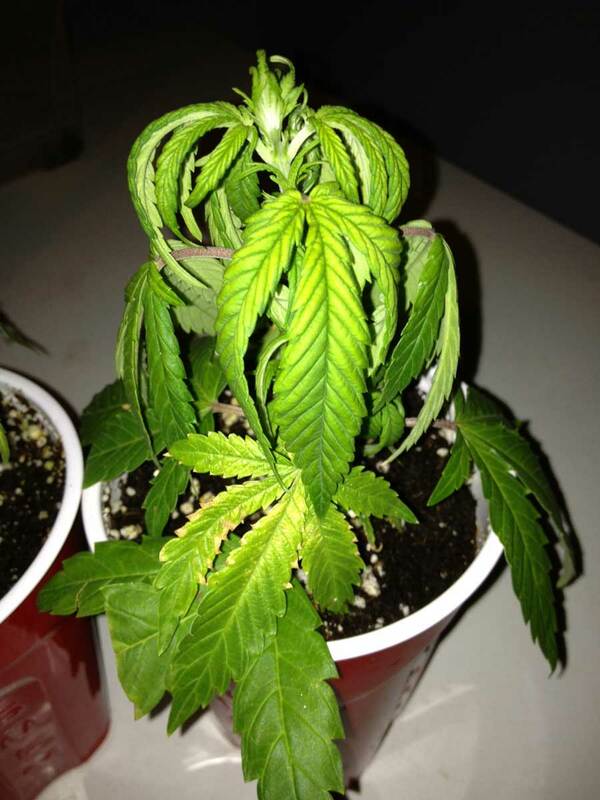 Here’s another example of a young cannabis plant that is underwatered, even in a big container (where the problem is usually overwatering). 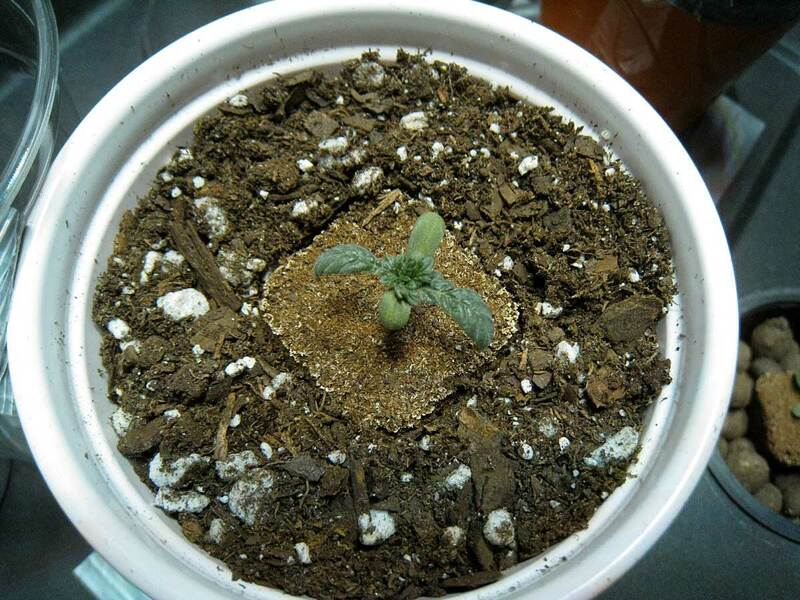 Notice how this cannabis seedling is basically just wilting and falling over, while the potting mix looks completely dry. Seedlings suffer greatly from being underwatered, even more so than from overwatering. 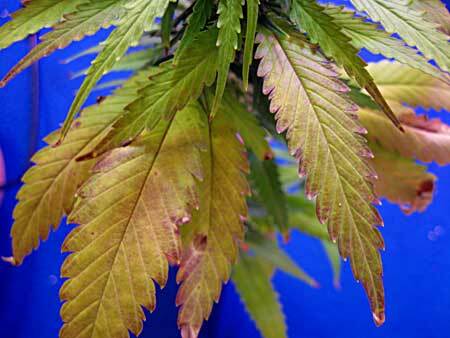 Often the grower will actually be able to see how dry the growing medium is. A big sign that the plant is being under-watered is when you can see the soil separating from the container. In this case, you can see the starter cube separating from the soil because it’s so dry. 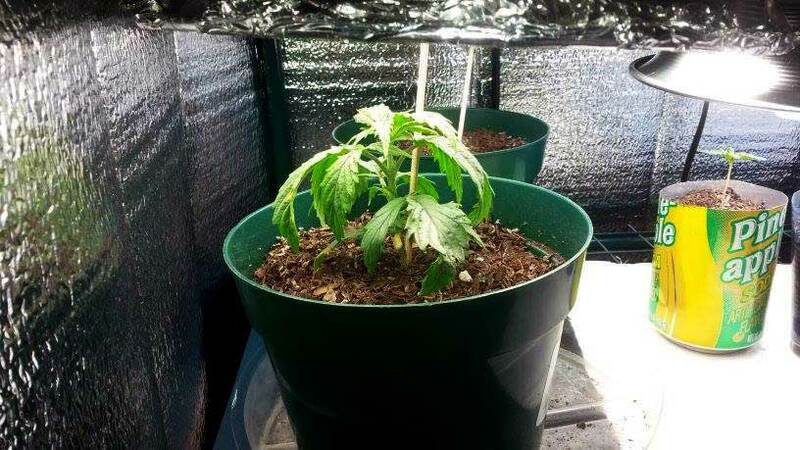 Underwatering is bad on it’s own, but it causes the most problems when young cannabis seedlings are also stressed by too high levels of nutrients, or when started in a “hot” (nutrient-enriched) soil. When underwatering is combined with too much nutrients, seedlings often become dark green and stunted, with twisted and discolored new growth. The solution for this (underwatering + high levels of nutrients) is simply to give the plants more water so they can establish roots and start growing again. Most plants will be able to grow out of this problem once they get enough water to start growing. While it’s not always the best idea to start out with a hot soil mix, most seedlings will easily grow into it if given a good growing environment. 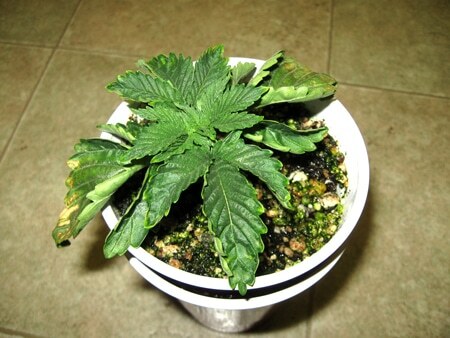 Check Out 3 More Common Cannabis Seedling Problems!